Translating Feminisms is a set of chapbooks showcasing poetry & essays from Vietnam, Nepal, South India - with more to be revealed. Check out the Kickstarter project! 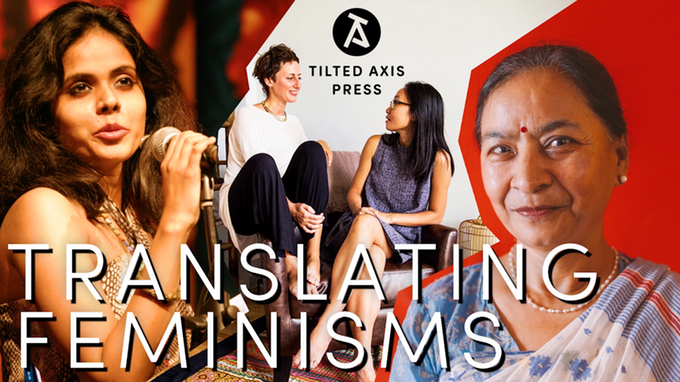 As part of Tilted Axis's wider project of decolonisation through & of translation, and in response to seeing WoC authors' work misread through a white feminist lens, we want to re-imagine the possibilities of a fully intersectional, international feminism, and ensure authors have the creative agency to contextualise their own work. Small, beautiful and highly collectable, the chapbooks will be available individually and as a set. The set of three will release this August (aka Women in Translation month). But first we need your help. Visit the Kickstarter before 12 July to support the project!